Welcome to this incredible custom home where the attention to detail will impress the most meticulous buyer. This is a Harrod built home which means it is quality throughout and the owners worked closely with the builder to attain the high end custom finishes and well thought out layout. 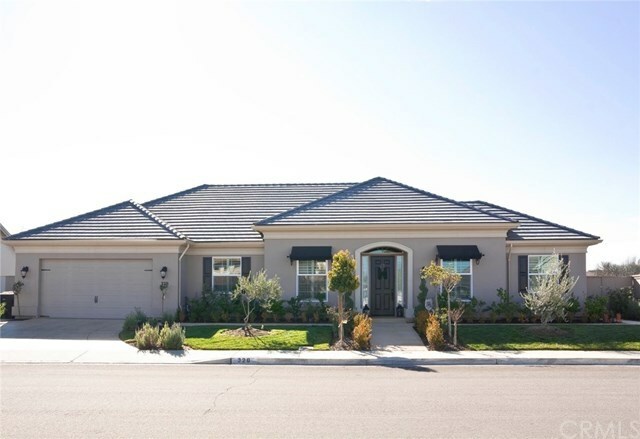 The front landscaping is beautifully crafted to reflect Paso Robles' scenery and as you enter the stunning foyer, all your senses will come alive as you are surrounded by all the features including the chandelier, flooring, crown molding, high ceilings that all blend together so beautifully. You'll find a formal dining room that leads into another cozy seating area with access to the outside patio and leads smoothly into the kitchen area. The heart of the home is the gorgeous chef's kitchen with an extended granite island that can seat up to six and features architectural pendant lighting and is perfectly situated to overlook the living area, breakfast nook and the fully landscaped backyard. This open floor plan is so pleasing to the eye with all the natural lighting and makes for an entertainer's dream come true with its very own walk in wine room. Every room in this home has the wow factor as well as functionality and the living room has a nice stone and beam hearth fireplace to take the chill out of the cool Paso evenings. The backyard is a combination of drought tolerant and drip irrigated plantings, decomposed granite, a large covered patio bungalow and several seating areas. Directions: Take Meadowlark east off Creston Road, left on Beechwood and immediate right on Cool Valley, home is second on right.